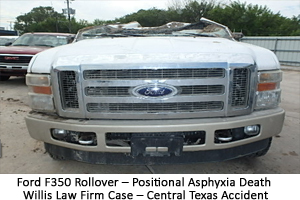 Ford F-350 Rollovers due to their size and weight can result in the deadliest rollovers and roof crush accidents today. During a F350 truck rollover, the weight of this truck far exceeds the capability of the F-350's roof supports and roof frame. If the driver of a F-350 truck goes off the roadway at highway speeds and quickly attempts to regain control the truck may start to jaw or go sideways. It that case, a rollover accident is probable. The weight and momentum of such a 9,000 to 11,000 lb truck is almost impossible to correct without “over-steering” or “over-correcting”. Most Ford F-350 truck rollover accidents occur when the driver is forced to take an emergency or evasive action after steering in one direction and then rapidly correcting in the opposite direction, such as a typical avoidance maneuver with a deer, a dog, pothole, road hazard, tire blowout, tire tread defect or separation or to avoid another vehicle. Sadly many of these normal evasive actions we take for granite in a passenger vehicle, with a F 350 truck often result in a rollover accident. When such a rollover occurs in a Ford F-350, the survivability of the occupants often depends on their height and on the amount of deformation or crushing of the truck's roof, roof pillars, roof headers and door frames. A Ford F-350 rollover and roof crush is usually a deadly combination. The roof structure of the two door Ford F-350 regular cab truck is comprised of a roof, two A-Pillars and two B-Pillars. On the Ford F-350 Super Duty Super Cab 4 doors, two A- Pillars, two, B-Pillars and two C-Pillars and a roof structure. On the four-door Ford F 350 Super Duty Supercab, an obvious problem exists. On the Ford F-350 Supercab, there is no B-Pillar between the 2 doors on each side. In a F 350 Supercab Truck rollover the roof crushes down on the top of the doors and crushes down much more severely than it would have if a B- Pillar existed between the doors to act as a roof support. This additional force or pressure on the truck's door latch or lock of the Ford F-350 door latch forcing the door lock or door latch to open during a rollover or a side collision exposing the driver and passengers to untold dangers, injuries and death. Ford F-350 Supercab rollovers the most severe amount of roof crushes. 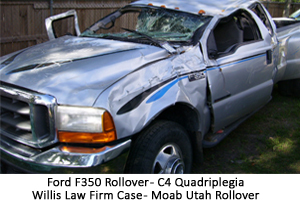 If you or a loved one has been seriously injured or killed in a Ford F-350 Truck rollover accident or F-350 roof crush or any Ford Truck or SUV rollover / accident and you like to know more about your legal rights in filing a rollover lawsuit or any other potential product liability or negligence legal action, then call and talk with Mr. Willis, a Board Certified Personal Injury Trial Lawyer with over years of product liability and roof crush rollover litigation experience.